Review: InstaFame – Famous Birthday Match and Sexual Expression Number BONUS! InstaFame – Famous Birthday Match and Sexual Expression Number BONUS!, developed by The App Crew LLC, shows you which celebrities share the same birthday as you. 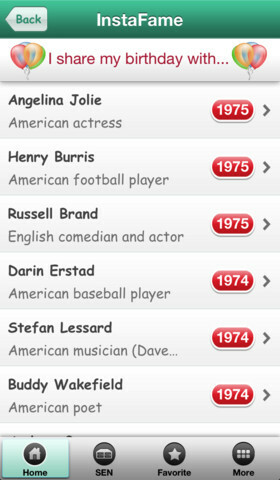 When I entered my birthday in, I was so surprised to see how many famous people share the same birthday as me. There was over 100 celebrities, with Heath Miller sticking out, as I have him on my fantasy football team! The list shows you all of the names, the year they were born, and a description of why they are famous. When you click on the person it takes you to the Wikipedia page so you can read more about them. When you find a favorite person, you can save it to your favorites or share it via Facebook, Twitter, or Email. SEN, Sexual Expression Number, is an in-app purchase available for $0.99. Once purchased you can get your SEN report based on your birthday. You can also get your Facebook friend’s SEN and share as well. The report you receive is individualized and represents how particular characteristics and traits manifest in our physical expression of love. InstaFame is currently FREE on the Apple App Store. It is a universal application so it will work on all of your iOS devices. You will probably also want to check out the SEN bonus as well.